We’ve moved into a new co-working space in Brighton, Platf9rm. With exciting projects underway, along with new recruit Katie, the time was right for us to expand into new office space. Located within Tower Point on North Road, Platf9rm is a unique and flexible space, encouraging creativity and collaboration. It’s also just a five minute walk from Brighton station, which is very handy for our frequent London trips. Spanning over two floors, Platf9rm is home to over 200 members from freelancers to offices of up to 22 employees. We’re thoroughly enjoying the laid back atmosphere and the diverse mix of lovely people we meet here each day. 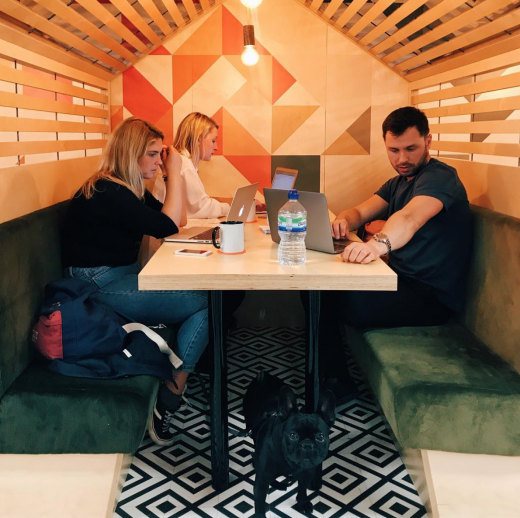 The interior has been designed by fellow Brightonians We Like Today, who are also behind the original Boxpark in Shoreditch and The (gorgeous) Bell in Ticehurst. We love the decor; on trend with plenty of natural materials and filament light bulbs and bright pops of colour incorporated throughout both floors. Each area enjoys unique design elements encouraging varying uses of space; from comfortable seating, to board rooms and quiet zones. We particularly like the ‘On Air’ booths for those all-important calls. Helping to deliver Platf9rm’s USP – a sense of community collaboration not normally found in the status-quo co-work office environment – there’s also a calendar of unique member events. From morning pilates classes and Virgin Start-up talks, to the more niche importance of beekeeping, there’s something for everyone and it’s refreshing they’re not just the typical churn of ‘businessy’ events. Everything aside, the main selling point for us is that Platf9rm is dog-friendly. We simply couldn’t consider working anywhere without the company of our beloved office pooch Worley! Come October we’re looking forward to splitting our time between the Brighton office and Platf9rm’s soon to open location within Hove Town Hall. We’ve been cooing over the designer impressions and can’t wait to see the new, larger space. So if you want to contact us by post (err what’s wrong with email?) you can reach us at This Is Publicity @ Platf9rm, Tower Point, 44 North Road, North Road, Brighton BN1 1YR. For more information visit www.platf9rm.com or follow on Instagram.